On sale while supplies last! 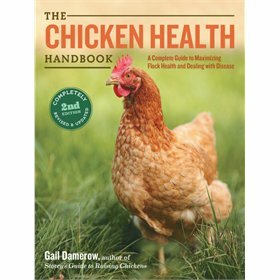 Have your chicken first aid kit at the ready--don't wait for one to become injured! 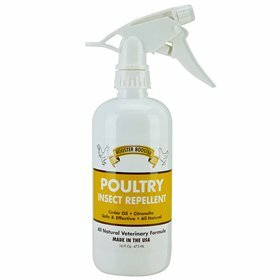 Made in the USA, this (truly) all-natural antiseptic/disinfectant spray is safe for open wounds. It is said not to sting or burn. 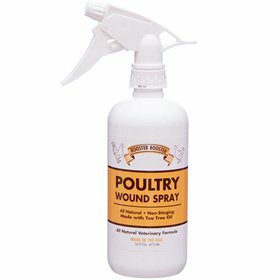 Caution: For deep punctures or wounds, consult your veterinarian. Avoid contact with eyes. If there are signs of infection, such as pus discharge or bad odor, please consult your veterinarian. Ingredients: Pure Tea Tree Oil, Comfrey, Myrrh, Goldenseal and Aloe Vera in Deionized Water. 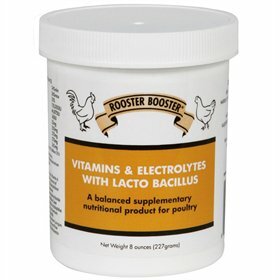 Rooster Booster Vitamins & Electrolytes w/Lactobacillus, 8 oz.